Names such as Yenko, Baldwin Motion, Fred Gibb and Berger Chevrolet conjour up the smell of burnt rubber and the heart pounding acceleration of classic muscle cars. 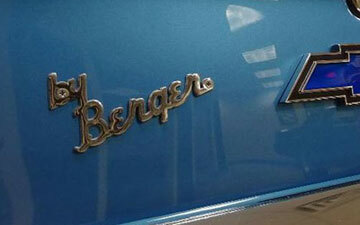 Berger Chevrolet is in the conversation whenever you talk about the top Chevy "super car" dealers back in the day. Today a 1969 Berger COPO Camaro is being offered for sale by Blackdog Performance Cars in Lincolnshire, Illinois. 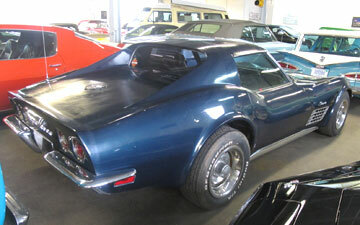 The Chicago area classic car dealer says it is an original muscle car which is both authentic and correct. “This is a no excuses 1969 Chevrolet Double COPO Camaro,” they noted in their ad copy. 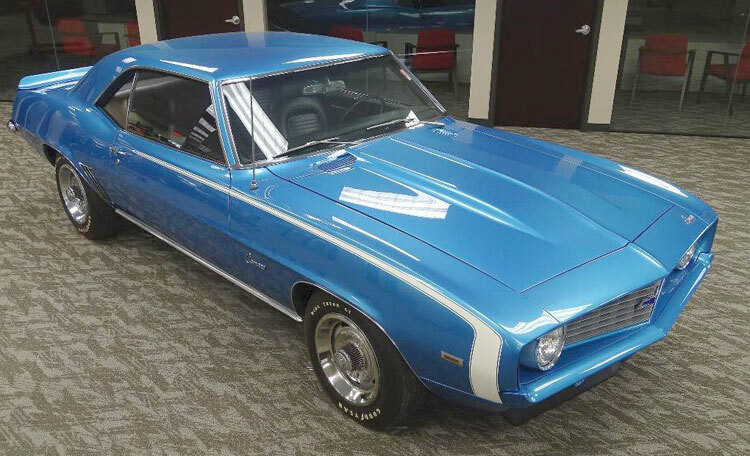 “The 427/425 horsepower engine and 4-speed transmission run exactly as they were intended to back in 1969 ... this is a straight-line animal!” Finished in the correct LeMans blue exterior with black vinyl interior, it comes with its L-72 big block 427 engine producing 425 horsepower. This one was a Double COPO referencing two COPO ordering code numbers, 9561 and 9737. The 9561 was the COPO order code for the L72 427/425 hp engine, and 9737 was for the “Sports Car Conversion Package,” which equipped the car with a 140-mph speedometer and beefier suspension and handling components. In a Pony car that weighed only 3,642 pounds, that much power would make it the ultimate factory built sleeper. In fact, you couldn’t buy it off a dealer’s showroom floor. You would have to order it through a special Chevrolet “hot rod” shop like the one at Berger Chevrolet in Grand Rapids, Michigan. Each car would come with the COPO package and then the dealer would trim it out with their own emblems and logos. Most were race prepped for drag racing, often right there at the dealership. Contact Blackdog Performance Cars to get more of the history on this Berger COPO Camaro. And be sure to read today's blog on the MyDreamCar.online site to find out more about the Berger COPO Camaros and the Double COPO packages. Then tell us your stories about those early Berger Camaros and Yenko Camaros you experienced in the comments section below the article. As we try to get this bitter winter weather out of our system, it dawns on us that Spring has Sprung. A reminder of that is the Daytona Turkey Run car show this weekend. 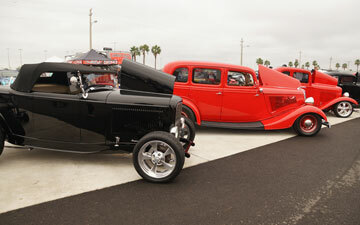 Get down to Daytona, Florida to enjoy the nice weather and all the cars on display at the Daytona Speedway. It is a rite of Spring to attend this show. The 30th Annual Daytona Turkey Run will be held this weekend, March 22-24, 2019. Lots of good food, music, hot rods and classic cars as far as you can see. It is the Spring edition of the Daytona Turkey Run where they allow registred cars to run on the track at the Daytona Speedway. What a thrill. With the car show season starting up across the country you'll want to break that "cabin fever" by planning your car show weekends. Be sure to check the Cars-On-Line.com Car Show Calendar to find your favorite local shows. We had a great call from the owner of one of the premier street rods for sale on our website yesterday. 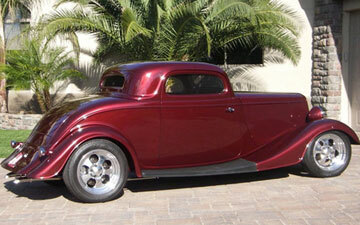 Richard from Bayfield, Colorado called us to tell us he had SOLD his 1933 Ford 3-Window Coupe. Newsletter readers will remember that this was the car NASCAR Champion Rusty Wallace had built for himself which was patterned after Billy Gilbert's famous ZZ Top 3-Window Coupe from the video. Not only was the car built by some of the members of the Penske team, the engine was built by Robert Yates, a legendary race engine builder. "Delivered it this morning to a great collector in Arizona," Richard told us. Richard had called our office last month to pick our brains on how he might find a buyer for his street rod. He needed a way to make it stand out. We told him to send us a video of the car and we would embed it in his ad. "That video really sold the car," he told us. "I can't thank you enough for telling us about using a video in our ad." We just put the video in his ad last week. He said the buyer showed up almost immediately. Now Richard knows why we always say, "You can advertise anywhere ... But you can sell on Cars-On-Line.com." Follow this link to the SOLD section below where you will see all of the private sellers who SOLD their cars through COL this week. When you see how effective a Cars-On-Line ad can be, you may want to advertise your car with Cars-On-Line.com. Click here to start your ad now. 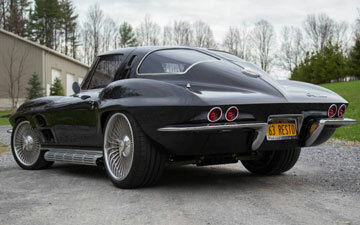 An amazing 1963 Corvette Split Window Resto Mod, custom designed by Joe Verrillo, has been listed for sale this week by Prestige Motorcar Company out of Clifton Park, New York. 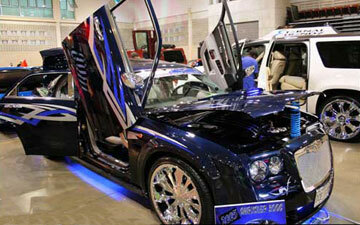 Verrillo is a big name in custom car building here on the East Coast. Quality and craftsmanship are a given. This stunning Split Window is powered by a C7 Z06 LT4 Supercharged 650 horsepower engine and holds the road with a C7 Corvette suspension. It transfers all that power with a 5-speed Tremec overdrive transmission with a custom Hurst SideWinder shifter. 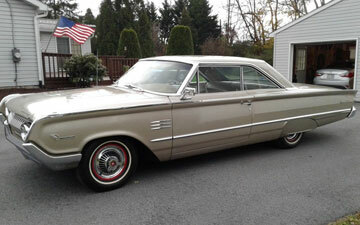 Notice Verrillo's version of '63 knock-off wheels, 19" front and 20" rears. There are so many unique body mods by Verrillo. The ZR1 fenders with carbon fiber vents, wide body quarter panels to accept the 20" wheels, billet aluminum hood grilles, and much more. The black Sparkle Pearl metallic paint is a special House of Kolor mix. Just look at the one-off interior. You can even talk with the builder to get more info. 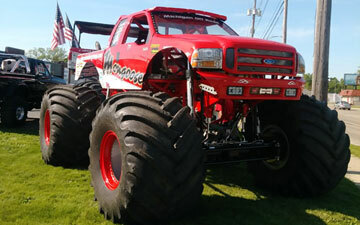 A Michigan monster truck owner is selling his 2019 Pro Built Monster Truck in our Monster Truck Section today. It has the all-chrome molly chassis, planetary axles, 572 ci Allen Root blown and injected alcohol motor which is adjustable from 2,000 to 2,500 horsepower. It has a JPT C6 transmission with matched torque converter built to handle the horsepower. The owner says he has had 30 years experience in pro racing and chassis building. He also has some other very interesting equipment for sale not included in this price, including a Mack Vision RV semi tractor and 53-Ft enclosed trailer. See more photos in the ad. We'll ask if they have a video for future newsletters. What would this big boy be worth on the Monster Truck circuit? Call and find out. A Grand National El Camino? A Florida hot rodder spent seven years building his brainchild, a 1984 Chevy El Camino which he cloned into a 1987 Buick Grand National. Should we call it a 1987 Grand National El Camino? Using the best materials and the best techniques, this professional builder painstakingly crafted his show quality conversion. He says there is $95,000 invested in parts and materials alone, not counting labor. It was completed in 2004 and has won many awards since then. Subsequently it has been featured in GM High Tech Performance magazine in April of 2006, and was also featured in the GS Xtra and an El Camino calendar. It is truly a one-of-a-kind. Interestingly, it has a 4.1 Liter Stage II motor from Buick. Only about 50 were ever produced. The seller says everything about the build is well done. He is selling it on Cars-On-Line this week. Carlisle Events is taking consignments for their Spring Carlisle Auction, April 25-26, 2019. Already they are signing up a stellar lineup of collector cars to be auctioned off during the famous Spring Carlisle Car Show, April 24-28, 2019. Held every year in Carlisle, Pennsylvania, this is one of the biggest collector events in the country. They say this 1958 Chevrolet Impala Convertible is an "exceptionally nice example" with some items collectors really value. It comes with the Continental kit, a 348 ci V8 big block engine and an automatic transmission. Look at the photos to view the highly detailed engine compartment with a triower. They say it has great paint and bright work. The interior is a red/gray tri-tone. Mustang collector know the story behind the Hertz Rent-A-Racer Shelby Mustangs. Carroll Shelby sold about a thousand special edition Shelby GT-350's with special Hertz colors. 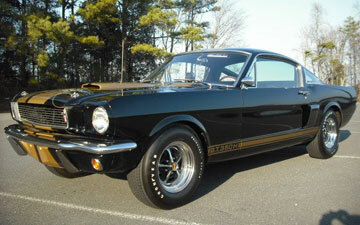 Here is a 1966 Shelby GT-350H which has a very rare and correct Paxton Supercharger. The special supercharger was only available on a few of the GT-350H versions and added 75 extra horsepower. This car comes with extensive receipts and history. 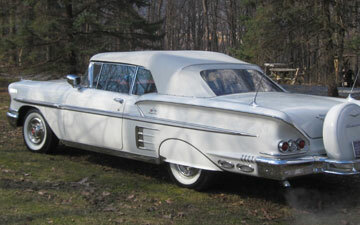 It will be one of the very highly prized cars to be auctioned off at the Spring Carlisle Auction. 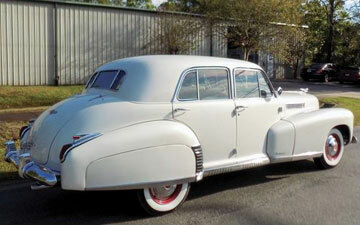 Cadillac collectors seem to all cherish the offerings of their favorite automotive manufacturer from 1941. It was a seminole year in Cadillac's history. This highly desirable 1941 Cadillac Series 60 Sedan comes with a new interior and wood trim, according to the descriiption in the Carlisle Auctions literature. Of course, it has a V8 engine and comes with a manual transmission (three-on-a-tree.) It is interesting because it is an older restoration and still presents well. You will notice that seat belts have been added for safety. This car is, after all, driven. It is among the last of the V-12 Ferrari's and therefore is becoming more collectible everyday. 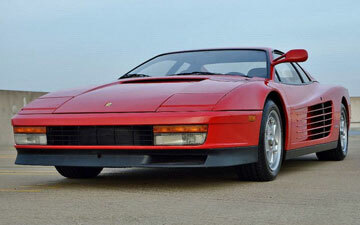 In Rossa Corsa red, this 1985 Ferrari Testarossa is a very special edition Testarossa. It is one with the Flying Mirror. Collectors are very fond of these limited edition models. It comes with the 4.9 Liter V-12 engine, a 4-speed manua transmission and is said to have just 44k original miles. These Testarossas are continuing to appreciate in value. It might be smart to pick one up now before they become "untouchable." For consignment information you can contact Carlisle Auctions at this link. RK Motors Charlotte is a collector car dealer that came into the market and changed everything with their forward looking approach to selling classic and specialty cars. One of their innovations was to do a quality video of each of their cars being presented for sale on their website. The revolving turntable giving you a view of all sides of the car was a studio innovation which few car dealers had ever thought of up to that time. Today we are highlighting one of their listings to illustrate how to do a collector car video. Just watch and see why they are so successful at advertising their cars for sale. The 1967 Oldsmobile 442 Resto Mod Convertible is stunning in their studio lighting. The video makes you want to check out this modern day restoration up close in the dozens of still photos they have posted in their ad. Nicely done. When Chevrolet gave in to their biggest fans and brought back the Impala in the 1990's their fan base was so grateful they put the reincarnated Impala on a pedestal for years. Obviously this 1996 Chevrolet Impala SS listed by Midwest Car Exchange in Alsip, Illinois is one of those cherished retro classics. They say this one still has just 9,800 actual miles on it. It was so popular that it helped inaugurate the retro movement among auto manufacturers. They say the miles are documented. For anyone wanting to get in on the Woody mania in the collector car hobby, with wood bodied cars appreciating in value, may want to read this. 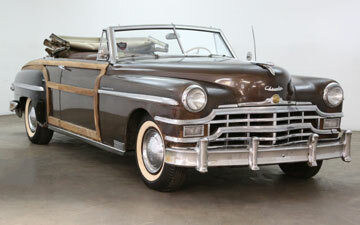 A timeless 1949 Chrysler Town & Country Woody Convertible is being offered for sale by Beverly Hills Car Club in Los Angeles, California today. They say it is a very easy project ready for a light restoration. It comes equipped with a manual transmissin, V8 engine and OEM radio. This is an extremely desirable project car to find and restore. They say it is mechanically sound and is offered at a very affordable price. custom painted/chrome 6-piece engine cover, beautifu custom interior with leather crocodile upholstery, even six TV monitors, and much, much more. Well, this week, the seller is getting real serious. He has reduced the price to just $18,500. Wow! Hurry! I don't think it will last the weekend. Top of the line BOB IDA Willys with A/C. Turbo 400. Crate motor 350. Chevy rear end. Has a 1939 McCulloch supercharger. LS1 eng. 350 hp. Simulated convt lift-off top. Ford Racing built 390 de-stroked to 351. Chromed 350 tuneport fuel injected eng. Custom bucket seat int. Gibbons body. "Sets new standards." Gray bench seat int. Vintage Air A/C. Only 15,760 miles. Factory optioned 6-spd. Full leather int. Power steering. Tripower. Flathead 239ci. Deluxe styled dash. Amos Minter restoration. See video. One owner. Trailer towing package. Custom built with a new engine. Only 52k miles. Black int. See dozens of photsos in the ad. Rough Country lift kit. See video. Pro-built 1957cc motor. Custom paint. Only 12k miles. Like-new dealer demo. Only 30k miles. Navigation. Like-new. One owner. Only 15k miles. 510 hp. Beluga leather int. 600 hp. All terrain. Supercharged 5.0L V8. Full leather. Low Grille coupe. Navy Blue int. 1993 Lincoln Mark VIII from Ronkonkoma, NY, All original. Runs well. New seats. Restored console. Runs great! 348ci V8. Long time owner. Few owners. Flying Lady hood ornament. Previous national event award winner. From a private museum. Correct 282ci eng. A "go-to" favorite for cruise events. Has a 4-cyl eng mated to a 3-spd standard trans. Wood. Matching #s 340 V8 Six Pack. See video. FM3 Panther Pink. Restored to factory specs. Fuel injected 327/360 hp eng. L71 Tri-Power. Red line tires. 4-spd. One owner. Protect-O-Plate. Original docs. Has a factory A/C. Matching #s Tri Power. Top Flight Award. Documented history. Original 327/375 hp eng. M20 4-spd. Original eng. Soft Ray tinted glass. Big block 396/425 hp. 4-spd. Detailed restoration. Cowl induction. M21 close ratio. Show winner. Restored. Chevy 409. Nice stock int. 350/300 hp. See video. Fully restored. 350 LT1 SS. Matching #s 351 Cleveland "Cobra Jet"
Rare Cameo Ivory w/red interior. Hurst 4-spd. Original Cameo Ivory. Big block 400. Solid. Triple Black. 4-spd. Factory Air. Has a 426 HEMI built by Amiligion Performance. Kalahari interior & top. Navigation. Only 516 built in Atomic Orange. LS7 V8. Only 282 miles. Supercharged 6.2L V8. 650 hp. Electronics Pkg. 526 hp 5.2L flat plane crank V8. Only 4k miles. 7-spd auto. Int Pkg. Black Nappa leather int. 503 hp. Only 20k miles. Voice activated navigation. Only 25k miles. 1 owner. Navigation. Only 14k miles. Weather Tech floor liners. Black leather int. 450 hp 3.5L Twinturbo. Recently listed. See the photos! Clean. Custom wheels. Leather int. Custom int. LS1. 6-spd tremec. Lingenfeltor 355ci eng. Roll cage. Rebuilt flathead V8. Boddy off restored. See video. Built 302. Nice interior sound system. New oak bed floor. Original 235ci inline 6. Twinpower Turbo 402 hp eng. Black int. w/orange stitching. Performance Edition. 1 of only 150. 365 hp 3.0L Twinpower Turbo. Supercharged LSA. See video w/Joe Verillo. Ramjet 502 w/fuel injection. See video. A code 289 V8. A/C. Wow. See video. Dual exhaust. 289 V8. 4-spd. Deluxe int. Amazing build with a 289 V8. Great colors. An original 5,985 mile survivor. Souped up replica. See video. Well preserved. Date-code correct 265ci eng. Museum car. VIN matching 327ci V8. Detailed underside. Mega block w 540ci and Indy 440-1 heads. Look for drag racing cars and stock cars in the Race Car Section. Power windows sunroof. Fuchs wheels. Only 10,496 miles. See video. Long time owner. Bamboo leather int. Spring Carlisle Auction, April 25-26. Triple SU carbs. Iconic and beautiful. 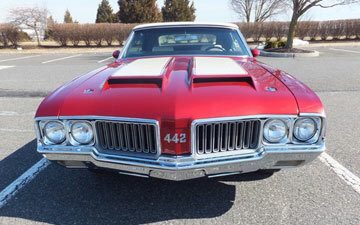 Recreations of the Oldsmobile 442 W-30 are fairly easy to find. However, not many will have original 1970 W-30 equipment. This 1970 Oldsmobile 442 W-30 Convertible tribute is said to have a real 1970 455 big block motor built to W-30 spec with a W-30 intake, exhaust manifolds, F heads, and a 3.23 rear end with W-27 cover. What's more, it has a Turbo 400 transmission, 12-bolt rear end and His and Her shifter much like you would have found in the real W-30 cars. The private seller from Pottstown, Pennsylvania says it is a great driving car with no issues. The paint is older (done 12 years ago) so the car has a few small scratches and chips but the seller says it still shows well. It is the star car among the fresh muscle car clone listings this week. This is a banner week for low price bargains. The DEAL of the DAY preview gives you first shot at all the cars that will be highlighted in the DEAL of the DAY feature of the Cars On Line home page. Often these cars sell in the newsletter before they even make it to the home page! You'll always see them here first though. When the Mercury Marauder Fastback came unto the NASCAR racing scene in 1963 it represented a game change in the racing world. Parnelli Jones won three races that year in a Marauder Fastback. By the time this 1964 Mercury Marauder Fastback came out a year later Mercury was already getting more respect from the younger new car buyer. A private seller from West Chester, Pennsylvania says the car just turned 70,000 miles. It has the 390 engine, Edelbrock aluminum heads with rare Ford cast iron headers, Holley 500 cfm 2-barrel carb, electronic ignition, and automatic transmission. Look at the photos to get an idea of the condition. It is a driver quality car that might be a keeper. It will be our DEAL of the DAY on Saturday with an asking price of $16,500. 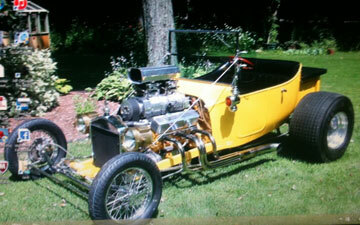 Here is a 1924 Ford T-Bucket being offered for sale by a hot rodder from Hamilton, Texas. This impressive looking T-Bucket is equipped with a 355 ci Chevy fed by a B&M Mega 250 Blower and 2 new Demon blower carbs. You see lots of chrome and brass to polish and give it some glitz. The seller says it is registered as a 1924 Ford with a clear Texas title. He says it has always been garaged, and seems to indicate that there are only 500 miles on the build. Be sure to check that with him when you call. In fact, this one would be a good one to have inspected before you buy just to be assured that it goes down the road straight. It will be our DEAL of the DAY on Sunday because the asking price is only $18,000. Collectors are beginning to give more respect to early Mustang Mach 1 muscle cars produced by Ford. The 1969 and 1970 editions are very much in play for collectors. They may be the next collectible muscle cars to go up in value. 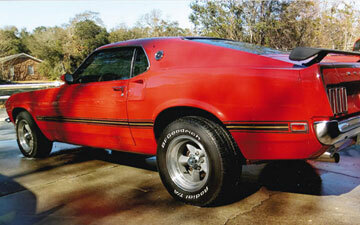 So here is a 1969 Mustang Mach 1 from a collector in Supply, North Carolina. It looks to be a driver quality car from the photos. He describes it as being an older restoration which "drives and runs well." It has the 351 Windsor engine, 4-speed, power steering, power disc brakes, factory tach, console with gauges, and a desirable fold down rear seat. We have it as our DEAL of the DAY for Monday next week. The asking price is $23,500. Be sure to have it inspected before you buy. One of the hot trends in the collector car market continues to be the classic Off-Road type sport utility vehicles coming out of the 1970's and 1980's. While classic Broncos, Blazers, Jeeps, Toyota Landcruisers and International Scouts are at the cusp of this market, there are a number of interesting vehciles that enter into this class also. Here is one of them. 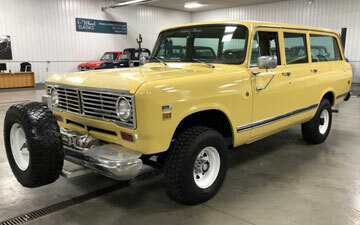 A 1973 International Travelall 1210 being offered for sale by 4-Wheel Classics in Holland, Michigan. This "beast" has 4.10 gears front and rear. There is no telling how many great fishing trips this one has seen. They say it is a real nice family off-roader with a nice solid body and transfer case. It is our DEAL of the DAY early next week with an affordable asking price. Would you pay $15,900 for this much fun? Well, it has finally happened. The retro Ford Mustang premium model cars are now going through "used car devaluation." You should be able to pick up some of these great sports cars for cheap going forward. Evidence this 2007 Ford Mustang GT Convertible offered by a private seller from New Bedford, Massachusetts today. He says it has 82k miles, and has been so carefully maintained that it has never seen a winter season, always garaged and has had no modifications done to it. The color is the desirable Grabber orange with a dark charcoal leather interior. It comes with power seat, air conditioning power windows and a new top motor. He says it also has all the owners manuals, and a window sticker. Haven't seen one this cheap yet, though. Asking price is $14,900. Cars-On-Line.com newsletter readers will remember Classic Car Liquidators, the classic car dealership in Sherman, Texas which has a track record of offering some great collector values for cheap. Here is another offering from Classic Car Liquidators this week. 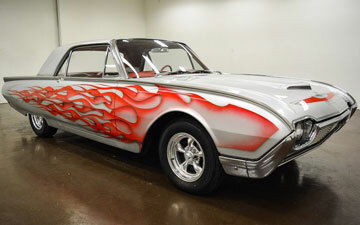 It is a 1961 Ford Thunderbird with custom flames and paint. Notice the fender skirts, American racing wheels and aftermarket radio system. We would consider this to be a mild custom with a 390 big block Ford motor and C6 Ford automatic transmission. But look at the photos. This one presents very clean. It is a great way to get into the collector hobby as a starter car. And it will be our DEAL of the DAY next week as the asking price is only $16,999. Classic Corvettes are still a great investment for would-be classic car hobbyists. Here is a 1971 Corvette which probably needs a new paint job. It is offered for sale by Classic Auto Showplace in Troy, Michigan. They are selling it for a client. They say it has just 47k miles which are stated as original by the seller. It is a numbers matching Corvette with a 350 ci, 270 hp motor, a solid frame, air conditioning and an automatic transmission. The car came from the factory in Mulsanne blue with a dark blue interior. Remeber, this is a "chrome bumper" Corvette which appeals to a certain type of Corvette investor. But you can buy it now for an entry level price. It will be our DEAL of the DAY late next week. They are asking $15,900. Mark from Philadelphia, Pennsylvania said, "Excellent service," after marking his 1970 Pontiac GTO Judge SOLD using our popular Run Till Sold ad. "Coast to coast advertising, excellent." Daniel from Easton, Pennsylvania sent his beautiful 1929 Chevy Sedan to a new home after using an ad here on the Cars On Line website. 1966 Pontiac GTO 1972 Chevy C-10 Pickup 1966 Chevy Impala Conv.